New article in Critical Policy Studies; "The politics of numbers. Framing intra-EU migrants in the Netherlands"
This article, co-authored by Mark van Ostaijen and me, is an outcome of the Urban Europe project IMAGINATION on the urban consequences of intra-EU mobility. 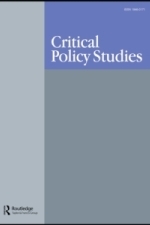 It has now been accepted for publication in the journal Critical Policy Studies. More information will follow soon. For more on the IMAGINATION project, see www.project-imagination.net. Click here for link to the article.